Privates Stillman and Albert Robbins were brothers from south Lake County. 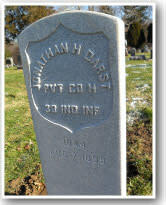 Both served in different regiments during the Civil War, and both died in service within a month of each other in 1864. 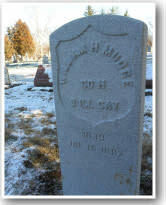 Stillman served as a clerk in the staff offices of the 12th Indiana Cavalry. Service records show he died in Hunstville, Alabama, on July 18, 1864, following a bout with fever. Albert Robbins died less than a month later on Aug. 6, 1864, succumbing to wounds he suffered at the Battle of Atlanta, according to the 99th Indiana Infantry’s regimental history. 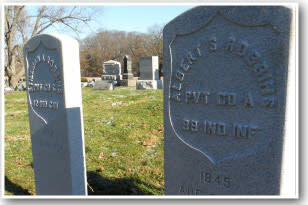 The brothers&apos; graves rest side-by-side at Lowell Memorial Cemetery, adorned with new granite headstones provided through the efforts of the Calumet Region Civil War Preservation Project in 2011. “There are those who recollect, a few years ago, a bright little boy, deeply interested in mastering that key to knowledge, the magic alphabet. Then, in early boyhood, leaving the sports of other children, and stealing away by himself with his favorite books, treasuring with care a neglected Sunday-school library. Then in the academy the attentive scholar, winning the love of teachers and classmates by obedience and politeness; and soon again in the business of life with a mechanical taste becoming a skillful engineer. And they saw in the child, the boy, and the man, a characteristic nobleness, manliness, and energy, that ever attracted attention and won respect and love. In November, 1863, when returning after a five months&apos; absence the young engineer finding a cavalry company recruiting in his neighborhood, after spending but a few hours under his parents&apos; roof, enrolled himself as a volunteer. The old marble headstone that once marked Private Van Alstine&apos;s grave had become so worn that the inscription was completely unreadable. The Calumet Region Civil War Preservation had to rely on old genealogical readings of the cemetery to identify the grave as that of Van Alstine, a German immigrant who is said to have joined the war effort while looking for his two sons in the camps of Company K. After finding his boys, Van Alstine is believed to have joined their unit rather than being separated from them. He was twice the age of many of the young men who enlisted in the regiment. 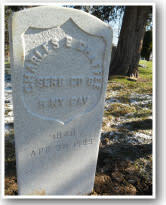 Darst&apos;s worn marble headstone was replaced with a new granite marker in 2011 through the efforts of the Calumet Region Civil War Preservation Project. 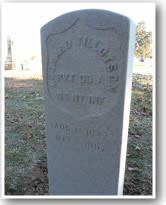 Tillotson&apos;s worn marble headstone was replaced with a new granite marker in 2011 through the efforts of the Calumet Region Civil War Preservation Project. Mudge&apos;s worn marble headstone was replaced with a new granite marker in 2011 through the efforts of the Calumet Region Civil War Preservation Project. 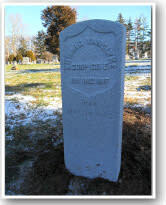 Chaffee&apos;s worn marble headstone was replaced with a new granite marker in 2011 through the efforts of the Calumet Region Civil War Preservation Project. 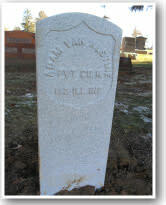 VanSlyke&apos;s broken marble headstone was replaced with a new granite marker in 2011 through the efforts of the Calumet Region Civil War Preservation Project. VanSlyke’s enlistment papers indicate he joined the Union Army at the age of 18 on February 10, 1865, which was the war’s final year. By March 1865, VanSlyke was promoted from private to corporal, but he didn’t have much time to experience his new role. VanSlyke’s muster roll records indicate he was sent to a hospital in Tullahoma, Tennessee on April 29, 1865, and died in service some time after that. Documentation for his cause of death has not yet been located by our research. Our best guess is VanSlyke died of some type of disease as the 151st Indiana was only in service for seven months of the war’s final year. The regiment saw only fort garrison duty at Tullahoma – no battles, according to National Park Service records. 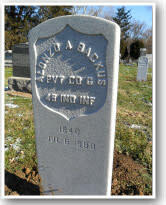 Backus&apos; worn marble headstone was replaced with a new granite marker in 2011 through the efforts of the Calumet Region Civil War Preservation Project.